TRUST AND TRANSPARENCY SHOULD BE THE BASE OF EACH HUMAN RELATIONSHIP! Talking about our story embarrasses us. This because a lot of years passed since the beginning of our project. We always hear mention of health and genuine food, but often people are in favour of fast and low quality food. This is due to the lack of time because of the frenzy of our lives. So, Fast Food are preferred instead of health and genuine food with selected ingredients. As a matter of fact high quality cooking is bordered to a marginal space. In our opinion high quality Sicily Food, rich in tradition and history, should be the leading part of alimentation. We learned the food is not only a physical need, but it is a way of being: it’s the mirror of the culture of a nation! Our traditions are the results of what we were looking for in these long years. We defended them proposing only excellence products. SLOW FOOD culture requires cure and time but it nourishes our senses. That of Nebrodi Black Pig is a reality forgotten for too much time. We asked ourselves ‘Why don’t we give back life to our everyday nature?‘ After all we daily deal with a rural and country world, as the Nebrodi mountains. So we rolled up our sleeves, we collected money (our savings) and we built brick after brick our company. As a child we saw it growing up and getting stronger and stronger everyday. Our initial weaknesses such as spontaneity and naturalness today are our strong points. Genuineness and transparency are the basis of our business Philosophy. The secret is the special raising. Animals are freed ‘en plain air‘ and their only food is made of acorn, barleycorn and bran. For this reason the ham and other products that we obtain have a soft and tender taste with an intense and high smelling flavour. Further more they contain oleic acid, which is part of the extra virgin olive oil. This is a ‘good fatty acid‘ to fight against cholesterol. But wait… it’s not enough. There is also Genetic to consider. This because we have the luck to live in the incontaminate Nebrodi mountains. Here a rare autochthon old race of Nebrodi Black Pig lives. This is also known as Black of Nebrodi. In the past we were risking to lose this unique specimen, but thanks to the rescue and valorisation programmes today we are able to offer you the results of this activity, which are genuine and autochthon products. 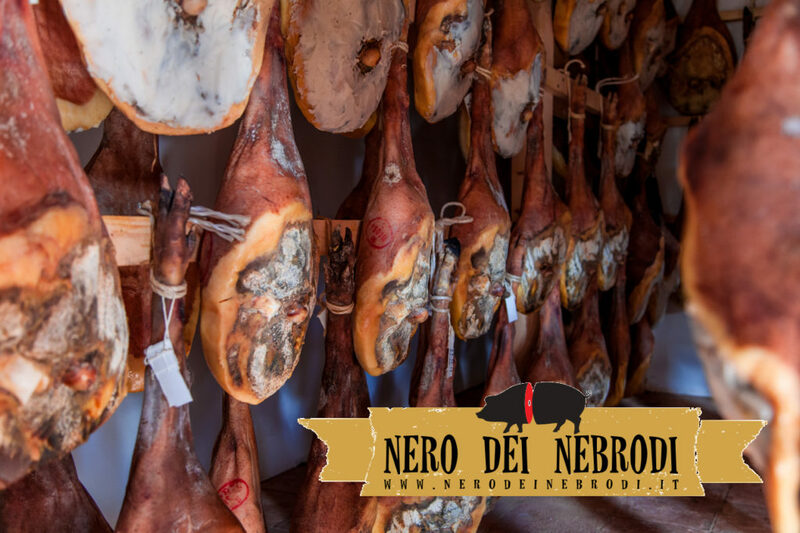 From the finest meat of this specimen we produce Black Pig Salumi (cured meats) with inconfondibile taste and flavour: sausages, salamis, capocollo, bacon, lard, cheeks, mortadella and hams are some of our high quality products. Each salami is the result of an accurate and careful work from the first stage of boning to the last stages of salting, processing and drying which take place in fresh rooms with the aim to maintain all the nutritious proprieties. 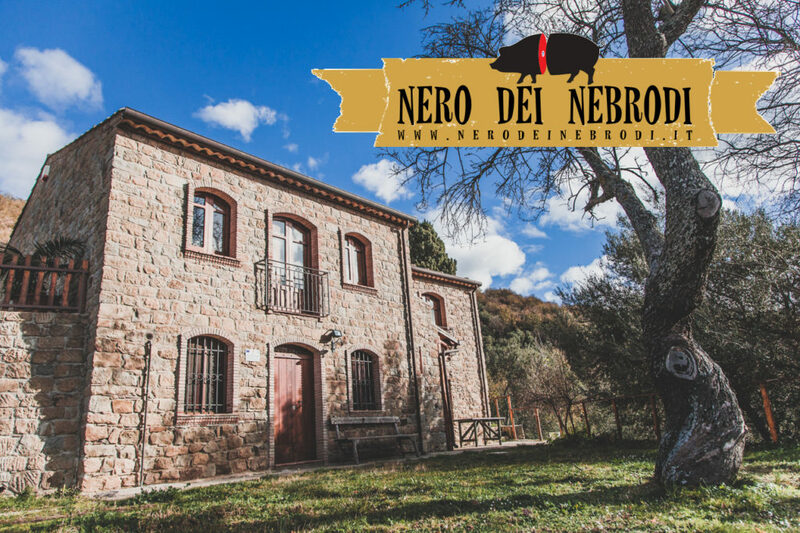 All the products realised with the Sicilian Nebrodi Black Pig meat smell a unique aromatic intensity which is highly superior comparing with those of other pig breeds. They also own a major attitude to long maturing which has the aim to expand and improve the natural taste of the meat. We seasons our meats with natural herbs without the adding of any preservatives. As a matter of fact the colour of our salumi is the original one. In conclusion it is a duty to say that our aim is to suggest and offer our customers high quality and genuine guaranteed products.